I just returned from a trip exploring Banff, Jasper, and Yoho National Parks with my mom. There is so much to do and see in the parks that I had a hard time figuring out which sights to see and how long to spend in each park. Now, having learned, I know the Canadian Rockies driving itinerary that I would recommend for the parks in the summer. My trip was 10 days long in total including two travel days. Short of wanting to pick up and move to the breath-taking Canadian Rockies permanently, ten days seemed the perfect amount of time to see the highlights of all three parks. I've also put 7 and 12 day itinerary option in this post. Day 1: Fly into Calgary and drive to Banff or Yoho to stay for the next 5 nights, it is approximately a 3.5 hour drive from the Calgary airport to Field in Yoho. We stayed in the little town of Field, which was the perfect place to access both parks and stay away from the mass of tourists in Banff NP. It is close to all the sights in Yoho and only about 20 minutes drive to Lake Louise in Banff. Got caught in a rain storm while canoeing Lake Louise. *I watched our weather everyday because the weather in the Rockies changes so much minute to minute. If you are interested in trying my next suggestions scramble the days based on the weather. Day 2: Go to Lake Louise and hike to Lake Agnus and Little Beehive. This hike is definitely worth it even though it is popular and busy for my taste. This short hike is only 2.2 miles to Lake Agnus and another .6 miles to the Little Beehive, however the constant uphill climb, 1700 ft. in elevation, made me huff and puff. The Lake Agnus Tea House is open from early June to early October. Hiking and tea... two of my favorite things. However, when I arrived at the Tea House around 11:30 it was jammers, to the point I couldn't physically get inside. All this being said I'd start this hike by 8 AM at the latest. If you are an avid hiker you can add a loop to the Plain of Six Glaciers (which also has a tea house) into the hike to make it a day-long affair. Afterwards enjoy Lake Louise. To get away from the selfie-crazed tourists (I take the occasional selfie, but one really does not need to do every single duck-faced pose in front of each view) around the lake we went into the Fairmont Chateau to rest our throbbing legs and wolf down appetizers at the casual restaurant overlooking the lake. For an extra-long day add an evening visit to Moraine Lake. View from Little Beehive of Lake Louise (blue lake on left), Mirror Lake (green lake in middle), and Lake Agnus (frozen lake on right). Day 3: There are two other sights I would make sure to see in Banff National Park, Johnston Canyon and Moraine Lake. I'd do one in the early morning and one in the evening to avoid the mobs at midday. The parking lot to Moraine Lake is closed when it is full, so midday during the peak season is pretty much not an option, but we went in the evening and it was absolutely lovely. If you have time, hike to Consolation Lakes from Moraine Lake. Johnston Canyon, while gorgeous, was the busiest hike we did, feeling more like walking through Disneyland than hiking, but the drive down highway 1A and stopping to marvel at Castle Mountain was a definite favorite of mine. Day 4: Explore Yoho National Park! Walking the loop around Emerald Lake and the hike to Wapta Falls are definitely doable in a day. On the way to Emerald Lake definitely pull off to see the Natural Bridge. We hiked the whole loop around Emerald Lake. (There were a few other hikes from there that seemed interesting, too). I would not hike the south part of the Emerald lake loop again as it was marshy, buggy, and the views from the south side were not as spectacular as the north side. The Wapta Falls hike all the way down to the bottom of the falls is definitely worth it, especially if you can time it with the evening sun to see the rainbow over the falls. The bottom of Wapta Falls at 6 PM. Convergence of Waters on the road to Takakkaw Falls. Day 5: This is my dream day because these two sights were on my wish list and we were too early in the season to do either of them. Lake O'Hara has a bus that runs from mid-June through September (it must be booked in advance through the park hotline or a 22 km hike when the bus isn't running). No private cars are allowed. Takakkaw Falls, a tall waterfall worth hiking to, is closed until mid- June due to snow. 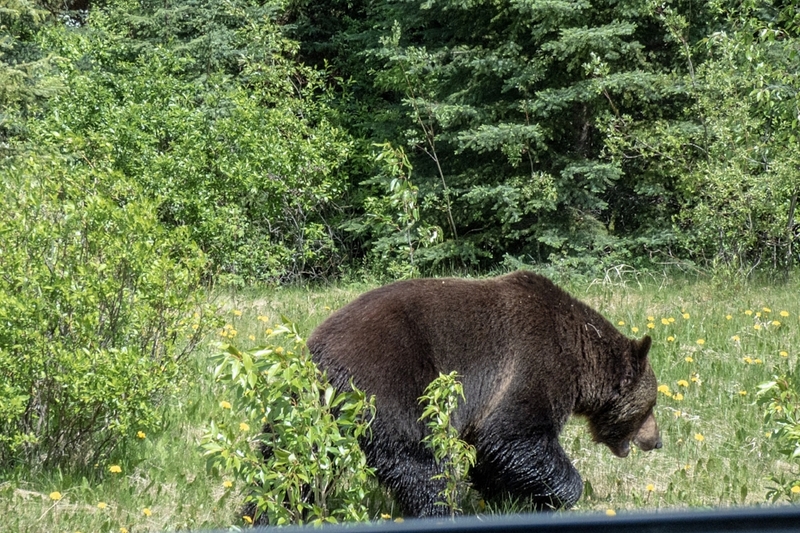 Grizzly eating dandelions 10 feet from the road. Day 6: Leave Field and head up the Icefield Parkway to Jasper. Along the Icefields Parkway definitely stop at Peyto Lake, Bow Lake, Bridal Falls, Columbia Icefield Center, Tangle Falls, Sunwapta Falls, Kerkeslin Goat Lick (a salty area by the road that mountain goats are drawn to), and Athabasca Falls. Then stay in Jasper. I would do the sights north of the Icefield Center a day later when exploring Jasper. That gives you more time in the lower part of the Icefield parkway to add a hike to Chephren Lake and/or Mistaya Canyon. THIS IS A LONG DAY OF DRIVING, but worth it for the the jaw-dropping beauty. We saw bighorn sheep, mountain goats, and ten bears along the Icefield Parkway right by the side of the road, so ask passengers in the car to be on the lookout for wildlife. 12 DAY ITINERARY OPTION: Take a detour at Saskatchewan Crossing to stay 2 nights at Aurum Lodge, a fabulous eco-tourism lodge on Abraham Lake, and on your day there go to and hike around Crescent Falls. Day 7: Explore sights around Jasper: Sunwapta and Athabasca Falls (if you didn't have a chance while driving up), Pyramid Lake, and Maligne Canyon. 7 DAY ITINERARY OPTION: If you only have the time to do a 7 day trip, checkout Pyramid Lake once in Jasper and then head to Edmonton to fly out. We flew into Calgary and out of Edmonton and it happened to be cheaper than flying round trip to Calgary. Day 8: Drive down to Maligne Lake and ride the boat to the famous, picturesque island. I did not do this because apparently the lake fills slowly through the summer as the ice and snow melt and, therefore, in early summer it looks dry and empty. Day 9: I wanted to revisit several sights that were my favorites on our last day. So use day 9 to pick your favorite sight to revisit or another hike you want to add close to Jasper and then head to Edmonton to fly out, OR for a very long day of driving, go back down the Icefields parkway to fly out of Calgary. Day 10: If you have not decided to live here permanently, fly out. Time of year to go? We went the first week of June hoping to avoid some of the tourist crowds that are there mid-June through mid-September. It was quite crowded in Banff National Park, but not yet very crowded in Yoho or Jasper. However, several hikes and roads were not open yet due to ice and snow at the higher elevations. Hiking: I could easily have stayed in these parks a month to hike a different hike everyday. While there are beautiful sights from the side of the road, I highly recommend being able to hike 3-6 kilometers so that you can add some amazing hikes to your trip. Also, considering we saw 17 bears, I recommend having bear spray with you at all times. Parks Pass: Guests to the parks need a pass, so look into the most economical parks pass option for you. We were there 10 days, so the Discovery Pass was best for us. 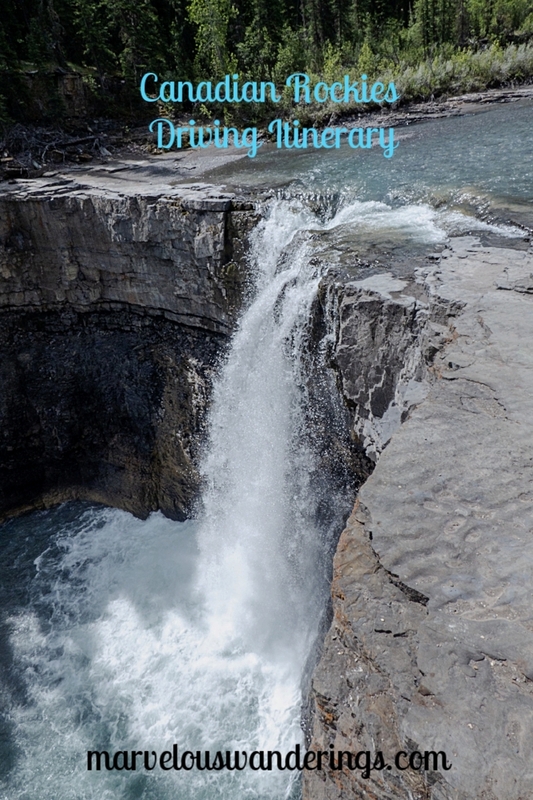 Did this post inspire your Canadian Rockies Driving itinerary? Let me know! Tips for staying on budget, and unexpected expenses on a trip to Iceland! Getting to Iceland is pretty inexpensive, and rental cars look like they will be affordable, but once we got there it became clear that travel in Iceland is very costly. I read this in many articles and other travel blogs before going, and it still shocked me. Iceland is a beautiful place and there are ways to see it without spending a fortune. Here are the tricks I learned there and the things I'm glad we spent the money on. I was expecting food to be expensive because I had read about it and yet it still surprised me. The first night we were in Reykjavik the grocery stores had already closed for the evening. (Thing to know: Grocery store hours are 11-6.) We went out to eat at the Laundromat Cafe on one of the main streets, Austurstræti. We spent $70 US on a tuna fish sandwich and a burger (no drinks). We had lamb soup and bread at Café Babalú, a popular inexpensive option, and it was still $17 US per person. This is a really yummy Reykjavik cafe, but eating there still drained over half of our day's food budget and the soup was not all that filling. The Icelandic hot dogs are a good option if you need to grab food that is not as expensive. They are quite delicious and available at most convenience stores as well as the famous hot dog stand in Reykjavik. If you book on Airbnb at least six months out you can find affordable private apartments with little kitchens so that you can cook your food. Hotels and guest houses are more expensive and don't offer the option to cook for yourself. If you book Airbnbs make sure they are registered businesses in Iceland (they pay taxes), which should be indicated in their descriptions. When, out of curiosity, I looked at accommodations closer to our trip only the hostels were less than $200 US a night. Car rental is one of those things that looks inexpensive when you book online, but when you get to Iceland the many insurance options add up. We paid for 2 of 3 insurance options they offered and I'm glad we did because we didn't have to worry; we got basic insurance and ash insurance. We definitely were not expecting the ash insurance, coming from a home without volcanoes currently erupting. However, the cars in Iceland looked like they had some ash and small rock damage, and we definitely didn't want to pay for that afterwards. We also got Wifi for the car (about $15 US a day), which was great for GPS and figuring out where the last Bonus grocery stores were before heading to the rural places we visited. If you are renting from Budget in peak tourist season expect a line that could easily take two hours to get the car you reserved at the airport. Budget has reliable reviews in Iceland so it is good option, but some of the other reliable companies like Hertz didn't have lines. Horror stories abound of cheap rental cars in Iceland breaking down, which is why we went with Budget. Reykjavik is a cool city that feels more like a big town, but it seemed more expensive than smaller towns. I liked staying on the edge of the Snæfellsnes peninsula or out on the horse farm in southern Iceland because I like being in the country more than in cities (even though we had a great Airbnb in Reykjavik). The sights we saw in Reykjavik were cool, but we could have done them in one afternoon instead of two days. Everything was so expensive that we just did a free walking tour and then continued exploring ourselves. THINGS TO GET BEFORE YOU EXIT THE AIRPORT!!!! You can do almost everything by credit card in Iceland, however for toll roads and smaller sights like Mt. Helgafell on the Snæfellsnes Peninsula you need cash. We had to do quite a bit of searching to find an ATM in Reykjavik. Pull a little cash out at the airport if you are planning to explore beyond Reykjavik; there are several ATMs in the terminals. The next important thing to get before you leave the airport is alcohol!!! If you are planning to go out and experience Reykjavik's nightlife or you like drinks with dinner, buy booze at the airport in the duty free store near baggage claim, ENOUGH FOR YOUR WHOLE TRIP EVEN IF IT IS A PAIN TO CARRY. Then have your drinks before you go out or go to dinner because one drink out can set you back $20 US easily. We bought a six pack of locally brewed IPA, which my hubby really liked (and he is an IPA snob), and the second cheapest vodka at the duty free, which is now my favorite Vodka ever. The only liquor stores, Vínbúðin, are in almost every town and have similar hours to the grocery store, but the alcohol is more expensive in those stores. Have more questions about your upcoming trip to Iceland? Let me know and I'll answer to the best of my ability! When I travel I carry a handy travel case of essential oils. In the past, especially when traveling overseas, I have gotten sick or had an impossible time adjusting to the time change. From getting ulcers in my eye in Italy and horrible sunburns from surfing in Hawaii, to searching for anything to calm food poisoning in Ireland, I have sustained quite the list of crazy illnesses and injuries while traveling. Now that I've discovered pure essential oils, however, I feel much more prepared when I hit the road or skies! I use DoTerra essential oils because their oils are put through a testing protocol to ensure they are Certified Pure Therapeutic Grade Oils. No chemicals make it into their oils. DoTerra oils come from the countries where the plants grow the best naturally, which also offers the opportunity to support economies all over the world by creating well-paying jobs where the plants are farmed. When I travel I carry two handy keychain-bags with 8 mini bottles of the following essential oils in each. On Guard Blend: I don't go anywhere without On Guard. I use it to boost my immune system before, during, and after travel (pretty much as soon as I hear anyone close to me cough) and as a hand sanitizer while traveling. I put this on the bottom of my feet or in an essential oil necklace (great to wear on the plane if someone is coughing next to you). I take On Guard beadlets and gel caps with me too. This blend is made up of Wild Orange, Clove Bud, Cinnamon Bark, Eucalyptus Leaf, and Rosemary leaf. Serenity Blend: I have a really hard time sleeping on planes as well as when I arrive at my destination. I find myself awake in the middle of the night because of the time difference. This blend calms me and supports my sleeping cycle. It consists of Lavender, Marjoram, Roman Chamomile, Ylang Ylang, Vetiver, Cedarwood, Ho Wood Leaf, Vanilla Bean, and Hawaiian Sandalwood. DigestZen: This blend is a MUST for travel because it soothes any kind of stomach unhappiness, from being too full from an awesome meal to soothing the tummy when something doesn't sit well. This blend is made up of Ginger, Peppermint, Caraway Seed, Coriander, Anise Seed, Tarragon Plant, and Fennel Seed. Balance Blend: After being on a plane, I tend to feel like my feet haven't quite touched the ground for several days, which is a bit discombobulating. I put a drop of this blend on my feet the day I land at my destination and it makes me feel grounded right away. This blend is made up Spruce Needle, Ho Wood, Frankincense, Blue Tansy Flower, Blue Chamomile Flower, and Coconut Oil. TerraShield: I use TerraShield on my skin while hiking and exploring outdoors to help prevent bugs from biting, and I think it smells fabulous. This blend is made up of Ylang Ylang, Nootka Wood, Cedarwood, Catnip, Lemon Eucalyptus, Litsea Fruit, Arborvitae, and Coconut Oil. Zendocrine: Zendocrine is useful to support the body's natural detoxification system. Let's be honest: while traveling we all tend to over-indulge in super delicious food and beverages. This blend is made up of Tangerine Peel, Rosemary Leaf, Geranium, Juniper Berry, and Cilantro. Breathe: Breathe supports my respiratory system if I feel like I'm having a hard time breathing. I use it to support my system in clearing out any congestion and opening the airways. I'll put it on chest, feet, or just inhale it. I like to have it with me at all times, especially when hiking. This blend contains Laurel Leaf, Eucalyptus Leaf, Peppermint Plant, Melaleuca Leaf, Lemon Peel, Ravensara Leaf, and Cardamom Seed Oil. Purify: I use this blend to keep my clothes smelling clean if I'm traveling for a long time. I'll put a few drops on a tissue in my suitcase or backpack, and low and behold, even if I've already worn the clothes, they come out of my case smelling lemony fresh. I also use it to relieve the itch of bug bites. This blend has Lemon Peel, Lime Peel, Siberian Fir Needle, Austrian Fir Needle, Pine Needle, Citronella Grass, Melaleuca Leaf, and Cilantro. Basil: I use Basil oil when I am exhausted, especially the day after flying overseas. Basil supports the adrenals, so it is great when you are feeling the stress and exhaustion of travel. I apply it on my upper abdomen when feeling exhausted. Frankincense: I use Frankincense mixed with Peppermint and Lavender if any part of my body is sore from travel. (Sleeping in strange beds and carrying my backpack takes a toll.) It is also useful for putting on cuts and bruises. Frankincense is an immune system supporter, as well. Ginger: Ginger is a fabulous calmer for motion sickness. While in Iceland, we were on curvy roads and little boats and I was expecting to be miserable, but I would just dab some Ginger on my wrist, a drop in my water to drink, and I felt great!!! It supports the digestive system if you are feeling icky. Juniper Berry: I used to have some painful urinary issues (I know TMI), but now I use Juniper Berry because it supports healthy kidney and urinary function. I bring this oil with me when I travel and apply on my feet or low abdomen. Lavender: Lavender is a lot like Frankincense because it has so many uses. I use it to soothe skin irritations, and as a red head I have particularly sensitive skin. I put this on rashes and sunburns as soon as my skin gets irritated. Melaleuca: Another great immune system booster, Melaleuca can support your system when the body is fighting pathogens. I use a drop of Melaleuca in water to gargle a couple times a day when I have a sore throat. Oregano: This one is very strong, so I use it on the bottom of my feet if I want to support my immune system. Oregano helps support your body when fighting icky germs. Airplanes and airports always feel like they are filled with germs. Peppermint: I know I said that many of these oils are must-haves, but peppermint is my biggest MUST-HAVE-WITH-ME-AT-ALL-TIMES oil. I use it for many reasons; on my neck to cool me down as soon as I get too warm, to freshen my breath, to help me wake up and focus in the mornings when I'm tired from travel, and on my neck if I'm feeling icky from one too many drinks the night before. Essential oils have an effect on us from simply smelling them, but also from topical use and ingesting the oil. There are different arguments out there about ingesting essential oil because they are so potent and some brands have chemicals in them. But DoTerra oils are tested to be safe. Even so I rarely ingest them because they are so potent (50 lemons are used to make one 15 mL bottle of Lemon oil). I feel best using them topically, especially on the bottoms of the feet where the pores are the biggest. If you are interested in learning more about DoTerra oils and the possibility of buying their oils wholesale, which I highly recommend because there are no monthly requirements, just a $25 yearly fee, check out my site my.doterra.com/marvelouswanderings. *This article is based on my experiences with the oils. I make no promises for a specific outcome when using essential oils. I am not liable if you try an oil and it does not work for you or you have a negative reaction to it. Whenever, I have been on a train, in a plane, or in a car, for 2 hours or more, my body really starts to complain about the lack of movement. Six years ago, I became a certified yoga instructor and this last summer I completed a certification in Alexander Technique- see my other website bodytunesstudio.com for more info. I now add yoga poses to long layovers as well as practicing them every couple hours on a plane, train, or car. I've gotten quite creative, while seated in tiny economy seats, to access some useful yoga postures and body movement without driving everyone around me crazy. I use the following yoga poses regularly when I travel, so that when I arrive at my destination I'm not moving like the tin-man. The above picture is a variation of a forward fold (Uttanasana) that nicely encourages the length and curve of the lumbar spine. I do this and then put the little travel pillow that they give you on international flights behind my back to keep encouraging the natural curves of the spine. The seats in planes and cars tend to take out the curves in our backs and can cause excess tension in the muscles. This variation of seated forward fold, also gently stretches the hamstring connections to the sit bones. Use the seat in front of you to rest your arms, so that you can gently encourage the lumbar curve to lengthen, and the belly to elongate. The above picture to the right is a deeper variation of the forward fold. This one adds a greater stretch in the lower muscles of the back. If you have any back pain, I recommend the first variation instead. The ability to do this pose depends on the space between seats (I can do this on some aircrafts and not others). If I'm unsure if there is enough space between the seats, I just do the first one- needless to say it would be very uncomfortable/embarrassing to get stuck like this. Before folding into this forward fold, lengthen your spine to its fullest in the first variation and then fold, so that you do not not create any compression in your back. The above picture is my seated, travel variation of wind liberating pose (Pavanamuktasana). As the name describes, it is good for the lower digestive track. I use it because it offers a nice stretch for the gluteus maximus and medius, as well as my hamstrings. Bend your knee towards the right side of your chest, interlace the fingers just below the knee cap, and gently encourage the knee towards your right armpit. The seated figure four pose(pictured above) is a useful to not only stretch the gluteus and hamstrings, but also the piriformis. Sit in the middle of the seat, roll to the back of your sit bones, elongate the spine, and then let the shoulder blades rest on the back of the chair. Cross your right ankle over the lowest part of the thigh, close to the knee, and lift the left shin up to gently rest on the seat in front of you. Repeat on the other side. A variation is not to lift the leg to rest on the seat in front of you (as seen in the picture to the right). After doing the figure four pose or the variation you can go into a gentle twist, which will add a stretch into the IT(Iliotibial) band. Cross the leg over by bringing the right knee to the chest and letting the right foot come to the outside of the left leg. Hug the knee into the chest with the left forearm and right hand. Turn your nose (if you lead with the chin it shortens the cervical curve) to look to the right and let the spine sequence into the twist after that. Repeat on the other side. Another posture you can do after the figure four pose, is "Rock the Baby". This will increase the piriformis stretch. Bring your right foot into the crook of the left elbow and knee into the crook of the right elbow and rock your leg gently right to left. Repeat on the other side. Stay on you sit bones and try not to fall back onto the coccyx (tailbone), as you continue to lengthen through the crown of your skull. When I travel, carrying suitcases and trying to sleep seated upright really take a toll on the happiness of my neck and shoulders. I use Eagle pose (Garudasana) arms to stretch out my rhomboids. Cross your arms in front of your chest, right elbow under left, bring your palms to touch or use your fingers to hook the other arm (like I'm doing in the picture to the left). Switch the elbow that is on top. Move your elbows slowly up and down to find the best stretch for your shoulders. A variation of Eagle arms is to hug yourself, like in the picture to the right (which feels sweet and may make you happy if you are experiencing frustrating travel delays). Cross your right elbow over the left and bring your palms to the opposite shoulder blade. Repeat with the left elbow crossed over the right. As seen in the picture to the left, you can stretch out the many layers of the neck and upper arm muscles by doing this simple stretch. For me, it is useful to stretch my sternocleidomastoid, trapezius, and several of the layers of muscles under that. Reach your right arm slightly to the side and down, turn your palm to face forward, and lengthen the crown of your head up (don't straighten your cervical curve, but elongate the curve) as the left ear drops towards the left shoulder. Move your chin up or down, to stretch different muscles in the neck. Repeat on the other side. If you are traveling with someone you know and want a front of arm stretch ask them to assist you with this one. You can do it by yourself, but a friend can help you with a deeper stretch (your arm will be in their face anyways if you are sitting next to them). This stretches the arm muscles in the front of the body, the pectorals and the front of the deltoid. Sit with your weight in the middle of your sit bones, bring your arm to the side, elbow in line with your shoulder, palm facing forward, and bend the elbow to a 90 degree angle. Don't engage the muscles in between the shoulder blades. Your buddy can gently press your elbow back towards the seat behind you, until you feel a stretch in your upper chest. I am not liable for any discomfort or injuries you may experience as a result of trying any of these postures. Please respect your body and never do something if it feels painful. When you reach your destination hopefully your body is happy and free of tension!!! Then you can do more fun yoga and travel with ease! Did you give these poses a try on your most recent trip?